Join momstown Winnipeg on National Breakfast Day, for the Kellogg’s Share Your Breakfast Event on March 8th, 2012.
momstown wants to help Kellogg’s give back to the Winnipeg community. At this event, members will receive breakfast kits and learn how we can share our breakfast. In Canada, 1 in 10 children live in poverty, and are at risk of starting their day on an empty stomach. 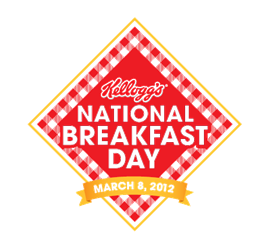 On March 8th, National Breakfast Day, Kellogg’s will be distributing mini-packs of Rice Krispies cereal nationwide, to raise awareness and reach out to children in the community. Kellogg’s will also be donating to Breakfast Clubs of Canada and Breakfast for Learning. You can help by purchasing Kellogg’s cereals – every box equals a donation! Join us for Share Your Breakfast – we’ll have activities for the kids, circle time, crafts, and a great way to help your community. Go to www.kelloggs.ca/SYB for more information.